Here is a brief excerpt from an interview of David McCullough by Diane Tedeschi that appears in Air & Space magazine. The Pulitzer Prize winner tells the human story behind the invention of the airplane. To read the complete interview, check out other resources, and obtain subscription information, please click here. 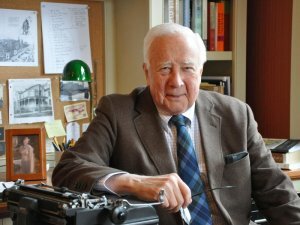 Author and PBS fixture David McCullough has received many honors, including the Presidential Medal of Freedom, for his books on American history. He spoke to Associate Editor Diane Tedeschi in March about his latest biography, The Wright Brothers. Do you think the Wrights could have accomplished what they did in another country? Or do you think there’s something about this country that fosters visionary thinkers such as the Wrights? Well, they might have done something in France, but I doubt it. I think it was the atmosphere—and much of the book is about this—the atmosphere of America at that time. In a town like Dayton, which was really in the manufacturing surge—not just big things like railroad cars and cash registers—but everything. Every imaginable thing. It was a day when almost everything was made in America, and said so, and proudly so. And so they were just part of a whole—I don’t want to say culture, that sounds too fancy. They were part of an era when people were making things and new inventions were coming on the market all the time. It was also—it’s that period between the turn of the century and World War I. A really protean time in America, and I think it’s the time when we take over and succeed in building the Panama Canal where the French had failed. When there wasn’t a national debt, there was a national surplus. And Theodore Roosevelt was president—there was a vitality and an energy. The sense that progress wasn’t a fiction, it was reality. And the typewriter and the lightbulb and the telephone. All these things coming along one right after another. So it was an exciting period, and the Wrights were right in the thick of it. In reading through the brothers’ correspondence and diaries, what do you make of their writing style? And what does their way of communicating with each other tell you about them? Well, you’ve asked a very, very pertinent question. Bishop Wright, their father, who was an itinerant minister, and was away much of the time, insisted that his children learn to use the English language properly and effectively as he had to do for his sermons and his essays. He kept a diary and he wanted to encourage them to keep diaries. He also encouraged them to speak the language effectively, as he did brilliantly. So when they were in the swim, as it were, they were always capable of writing superb letters, not only to each other—with an extensive vocabulary and an extensive sense of what makes English really work—but [also] in their business proposals, their explanations of what they had accomplished, the speeches that Wilbur gave in front of engineering groups and scholars and the rest. You read them today, and it’s humbling. And again, they never went to college. They never even finished high school. What role did their sister Katharine play in their success? Their mother had died in 1889. It was the worst blow in the history of the family, and she died of tuberculosis. After that, Katharine became the woman of the house. She was the more sociable of the children. And she kept them in line, and if they didn’t want to do something, and she felt they ought to do it, she said, “You got to do that.” She was always there to be a help when needed. The most dramatic example was when Orville was putting on a demonstration over at Fort Myers across the river from Washington with a young Army lieutenant [Thomas Selfridge] flying with him [as a passenger]. He crashed, and the young man was killed—he was the first fatality from an airplane. Orville was very nearly killed, and he was terribly injured. And she got word back in Dayton—she was a high school teacher. She taught Greek and Latin. She’s the only one in the family who ever went to college; she went to Oberlin. And she loved college—she was superb at it. She was bright as could be—they all were. Extremely bright. Wilbur in my view was a genius. Literally a genius. But the minute Katharine got the word that Orville had had this terrible crash, she called the principal and said, “I’m taking an indefinite leave of absence.” And she was on the train that night from Dayton to Washington. She got to Washington, and she went over to the Fort Myers hospital and was with him for the next five weeks or more—tending to his every need. In some ways she saved his life, but certainly saved his spirit. He was very hampered by pain from that accident for the rest of his life. And she stuck with him. Diane Tedeschi is an Associate Editor at Air & Space.